Escape rooms are a humorous signal of prosperity. Who knew that a fad would emerge where people pay $30 each to voluntarily trap themselves in a room for an hour, simulating some kind of fantasy escape scenario? Ignoring the simulated danger, the price per time investment there is high, especially when you consider the low chance of success in most arrangements I’ve seen (so you’ll try it again I suppose?). As wealth increases, luxury goods like escape rooms become more possible, though looking back I don’t think I would have predicted their rise. On the other hand, when you consider their adjacency to increasingly popular games–particularly tabletop games, perhaps it wasn’t so odd. Crossword puzzles have been around a long time–cryptography even longer. Still, as amusing as escape rooms are, as a concept I don’t buy into the trend of “escape rooms in a box” that have spewed into the marketplace over the last couple years. They neither require a room nor do they have anything but the barest relationship to the concept of escaping. You’re trying to escape the blight of worldwide plague in Pandemic but I don’t see anyone calling that an escape room. There’s already a game called Escape, and at least there you have the thematic connection of controlling figures trying to escape a physical space. 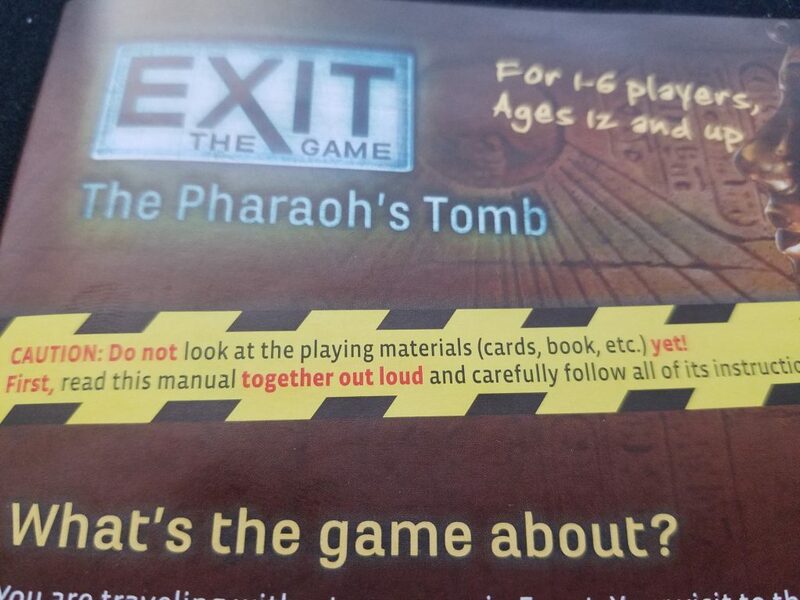 That’s not to say I wasn’t intrigued by the prospect of playing EXIT: The Pharaoh’s Tomb. I’ve been carefully monitoring all of the different “escape room” game systems and the consensus seems to be that the EXIT series is the most reliably fun. After playing one I don’t doubt the consensus. The Pharaoh’s Tomb was chock full of interesting puzzles that, like a good teacher, were challenging but fair. Once we figured out what was going on we ran the gamut of emotions one would want to experience in such a game: bafflement, anger, inspiration, and ultimately triumph. The EXIT games are all one and done (without an option to gift it to someone else–things will be cut, written on, and destroyed), so I want to be careful about spoilers. But the puzzles were varied, with different modes of thinking required to complete them all. Nothing was too crazy or unexpected, but there were a couple of creative puzzles that made us grin. The designers clearly put a lot of work into making the individual puzzles diverse and clever, and I’d have a lot of fun with just a giant book of them. While I have no complaints with the discrete puzzles, the meta puzzle was a bit frustrating. Translating an escape room scenario (tenuous as that connection is) to a box creates a number of immediate challenges. First, you don’t have a moderator who can give you hints over the PA or sit stoically as you beg desperately to the air for hints (my first and only escape room was a…unique experience). As is proper, in place of a breathing, feeling human is a deck of cards. The hint cards provide a couple of interesting functions besides their stated purpose. First they provide a bit of grounding so you know what’s actually going on at the beginning of the game. Every other part of the game is a bit vague about what’s happening, and the cards helpfully point out that there are going to be X number of puzzles with clear identifying symbols. Second, they add a layer of interpersonal psychology to the game as everyone needs to come to a consensus of whether or not a clue should be revealed. I mean, I suppose that’s how it ought to work, though I can imagine a situation in which a gleeful clue-revealer goes rogue and needs to be restrained. Unfortunately the clues themselves are lackluster. I don’t think it’s too much of a spoiler to say that the first card on each clue deck tells you what card numbers you need to solve the puzzle, the second gives an actual clue, and the third basically gives it away. If you’re particularly picky about spoilers forget what you just read. The problem with this system is that it’s patching an aspect of the game that feels poorly designed to begin with–the uncertainty over whether or not you’re even equipped to solve the puzzle you’re trying to solve. On more than one occasion we finally flipped up that first clue after puzzling over something only to find we were working fruitlessly. It’s an awful feeling to see that, especially when you’re been toiling away thinking that you’re so close to making a breakthrough. It’s a slap on the wrist. “That’s part of the puzzle, stupid reviewer!” shouts the chorus of fans from the back. Listen, people. Vagueness does not a puzzle make. I should feel clever, and I should appreciate the cleverness of the puzzle designers when I’m playing one of these games. I don’t want to get stuck or lose points because I couldn’t decipher a road sign that can’t make up its mind if it’s supposed to be its own challenge or if it’s just poorly drawn. Early on in our game we completely misinterpreted one of these signs, made a guess based on that misinterpretation and happened to hit a false positive. That resulted in a lot of confusion as we tried to figure out what on earth happened. Granted, a false positive should be rare as the method by which you guess at answers and see if you’re correct is downright ingenious. It involves a deck of cards you need to reference and a quad layer decoder wheel reminiscent of those super early PC-game anti-pirate tools. 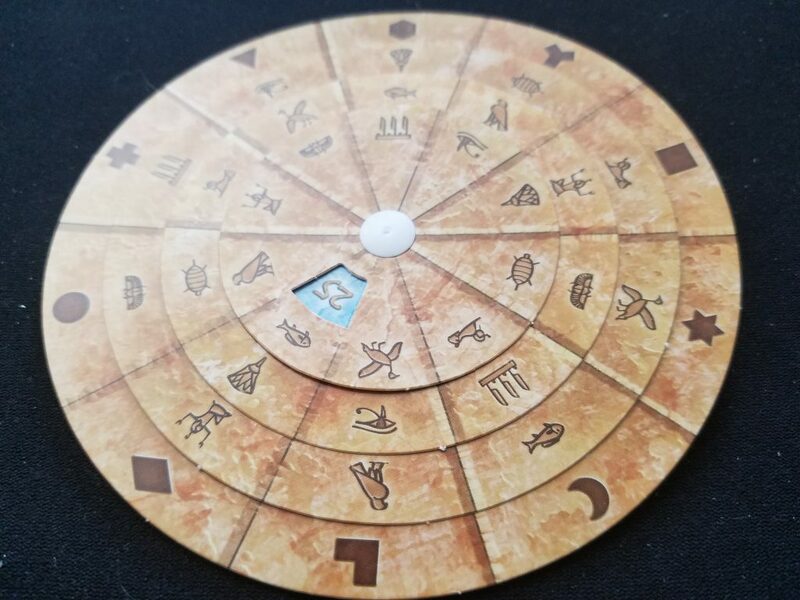 It lets you guess without worrying that you’ll ruin the experience if you’re wrong and in The Pharaoh’s Tomb it looks like an ancient hieroglyphic puzzle device straight out of Indiana Jones or Uncharted. The box says the game can play between 1-6 players, and I have no idea how they arrived at that number. There’s nothing to stop a dozen people from playing at once, though they wouldn’t have much fun. We played with 4 and that felt like too many. Most of the time only two players had anything relevant to examine, so the other two had to strain to see the often small images and provide any support. Sometimes in an effort to contribute I’d spend that time sorting the cards and pieces we’d used to make the play space more tidy. It was annoying enough that I’m never going to play with more than two ever again with this series. 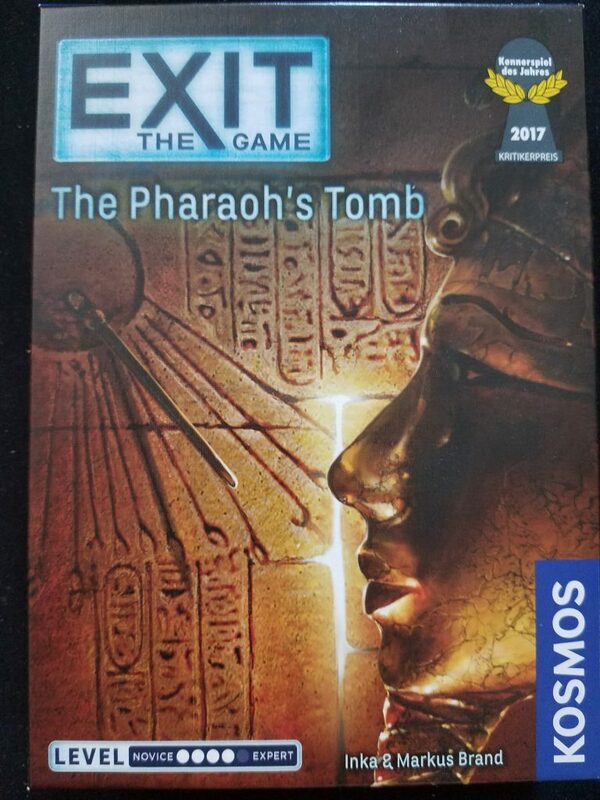 Despite my quibbles I really did enjoy EXIT: The Pharaoh’s Tomb and I look forward to playing more in the series. Designers Inka and Markus Brand seem to have a knack for creating clever puzzles and I want to see them stretch what’s possible in a $15 small box game even further. EXIT may not be an escape room, but it’s a damn fine single-play binary-answer discrete puzzle game.